Forbid is made from vegetable protein that has been purified and crystalized. It is used as condiment on the food of dogs and cats to stop them from eating their own stools or the stools of other animals. It should also be administered to animals whose stools are being consumed. Alpar forbid itself is tasteless and works on making stools unpalatable once it has been ingested. 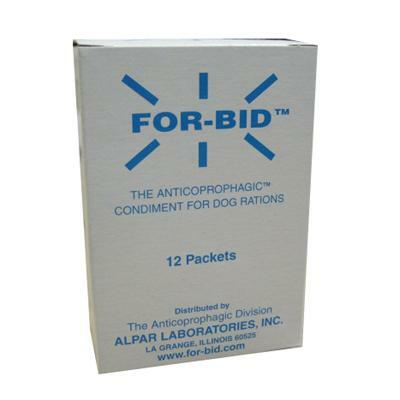 Years of use have proven Alpar Forbid to be Safe & Effective. Dogs: 3-20lbs - 1/4 package twice a day. Dogs: 20- 100lbs - 1/2 package twice a day. Use for 5-6 days, you should see a response after the first or second day. This will usually curb coprophagy for months, often permanently. Cats: 1/4 package per day for 4-5 days. If coprophagy starts again after initial dosage, give 1 gram per day (package contains 8 grams) for 2-3 weeks or as necessary. Be sure you are not overfeeding your pet because undigested food in the feces will propagate coprophagy. Intermediate: Dogs 3-5 years old that have coprophagy for one to three months: For-bid is about 95% effective. Chronic: Dogs 5 and 6 years old that have been doing it for one to three years: This is not coprophagy but a bad habit. Here For-bid may not work, if it doesn't, try basic behavior modification in addition to obedience training.